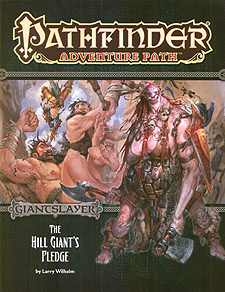 "The Hill Giants Pledge", a pathfinder adventure for 4th-level characters, by Larry Wilhelm. A detailed look at the various drakes that soar throughout the Inner Sea, by Russ Taylor. A collection of exciting additional encounters set in the Mindspin Mountains, by David Schwartz. A perfect ambush goes awry in the Pathfinder's journal, by Michael Kortes. A host of new monsters, by Benjamin Bruck, Thurston Hillman, Mikko Kallio, and Larry Wilhelm.